Studio Oklahoma was created by The Oklahoma Film + Music Office to provide opportunities for like-minded community partners to support Oklahoma’s thriving creative class and serve as a platform to promote and connect Oklahoma’s filmmakers and music makers to national and international audiences. To learn more, please read our press release. 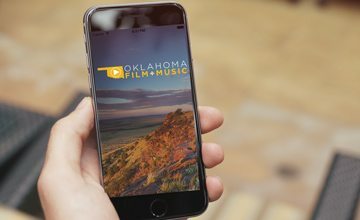 OF+MO will host our first Oklahoma Film + Music Conference this November in Oklahoma City. This event will feature two days of panel sessions with a wide variety of topics to benefit statewide industry professionals. Additionally, this first annual conference will commemorate 40 years of the state supporting an organized Film Commission by recognizing our state’s success and the strides we’ve made in putting Oklahoma on the map as a top filming destination in the United States. Join OF+MO as we roll out the red carpet for our local industry members alongside some special guests to help shine a spotlight on making movies and music in Oklahoma. More information will be announced in the coming months, including registration information as well as vendor and sponsorship opportunities.